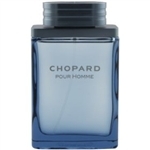 Chopard Pour Homme is an amber-woody-oriental blend. It opens on notes of yuzu, cardamom and star anise, leading to a heart of nutmeg, bourbon pepper and clary sage. The base features labdanum and cedar wood.